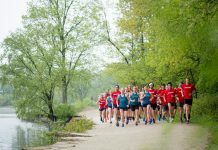 The Grand Rapids Triathlon is the perfect race for many reasons. 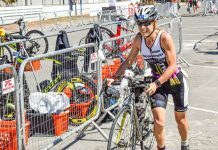 First, it offers a variety of distances: Sprint (600m swim, 12-mile bike, 5k run), Olympic (1500m swim, 25-mile bike, 10k run), and Half-Iron (1.2-mile swim, 56-mile bike, 13.1-mile run). Next, the swim is in a small little river, and not Lake Michigan-style (ahem, Racine and Steelhead), meaning you’re pretty much guaranteed a chance to do the swim. Finally, it’s a destination, yet local, type of race. It’s a three to four hour drive from Chicagoland depending on traffic and feels far enough away to be a “vacation,” while also being close enough to not have to take a day off of work. 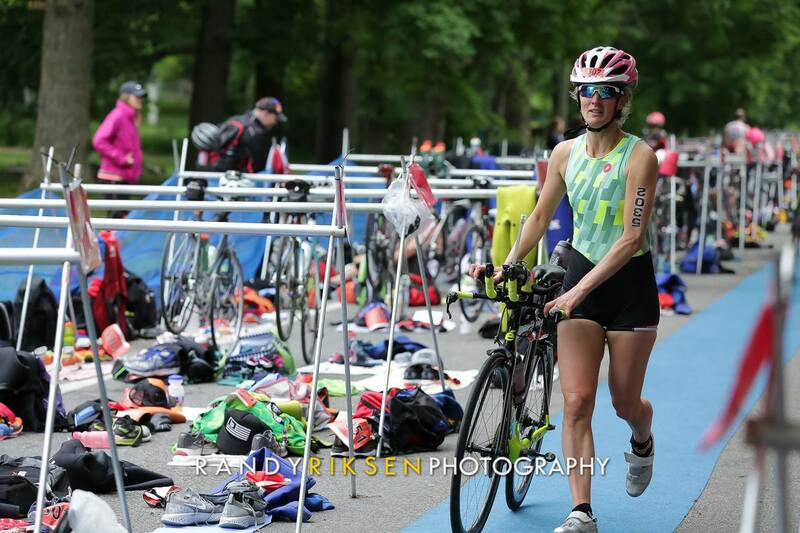 Having three different distance races, AND being host to the USAT Clydesdale and Athena National Championship, this race is super well-organized. The transition area is really long, but everyone has to run through it both ways, so it doesn’t really matter! All of the half-iron distance athletes begin the swim first, with the first wave starting at 7 a.m. and the last starting at 7:15 a.m. The Sprint swim goes off in waves from 7:30 a.m. – 8:05 a.m., and the Olympic waves go off from 8:15 a.m. – 8:30 a.m. The staggered starts help greatly to decrease the amount of bikers on the course at the same time (unless you’re near the front end of the half-iron distance race, in which you might encounter some Olympic distance athletes). After exiting the swim, you run through transition to grab your bike before heading out for your 12, 25, or 56-mile ride. 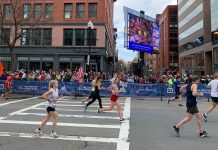 The sprint and Olympic turnarounds are very obvious, which is not so fun for those competing in the half (especially if you’re having a rough day!). The roads are decent, but definitely do not make for a fast bike split by any means. The best part about all three races are that they are out-and-backs, meaning you can see your friends/family/spouse/competition once you/they pass halfway. Transition two is just as long, but this time you’re not carrying a wetsuit and goggles. Right as you exit transition, volunteers are offering water and Gatorade, which is definitely welcomed. The run course is two loops for the half-iron distance. I would definitely not describe the run as easy, with slight inclines and up-and-down out-and-back sections. It was super nice to have a few out-and-back sections as you again get to see those that are close enough to you and gauge how you are doing. It is a bit sad to see the Olympic distance athletes heading in as you are completing lap one of the run, but the crowd support totally gets you pumped to go back out for loop two. The finish line is probably 200m deep with spectators cheering like crazy as athletes finish. I truly felt like I was at an Ironman with the way the crowd was cheering. Also kind of cool to note, you can bring your kid/spouse/pet across the finish line with you (something you cannot do in Ironman events). Finally, awards and swag. The t-shirt/tank this year was super cool. This race always has pretty nice t-shirts for athletes. Athletes could also grab some Chik-Fil-A cookies, pizza, chocolate milk, and fruit after finishing the race. Overall, this is a super well-run triathlon, family/spectator friendly, and a great way to spend a weekend “away” in the Midwest.